I'm looking for a cheap truck to do some install and testing on. worn out tires are fine. street legal with a title a must. price range from a 6 pack of natty to a dirty 30. Last edited by turbo2387; 02-14-2018 at 07:06 AM. it would also be nice if it were somewhere near central Indiana. Got a 1996 1 ton 2wd dually, with an NV5600 6 speed, fairly clean body, beat up dually bed, decent 17 inch tires and a blown up 12 valve. I don't do alcohol, 420, or any other mood enhancing substances. However, I will do $2500 cash. I would also trade for carpentry work, or such, to finish the interior of a house. How blown up is the engine? We talking head gasket or rod through the block? It never threw a rod, but it's not like it didn't have a chance to. You didn't mention you wanted it perfect. In fact, your op indicated otherwise. Last edited by Mark Nixon; 02-14-2018 at 10:37 AM. Running would be a plus or close to it. This whole thread sounds like one big party. It also has new rubbers.. 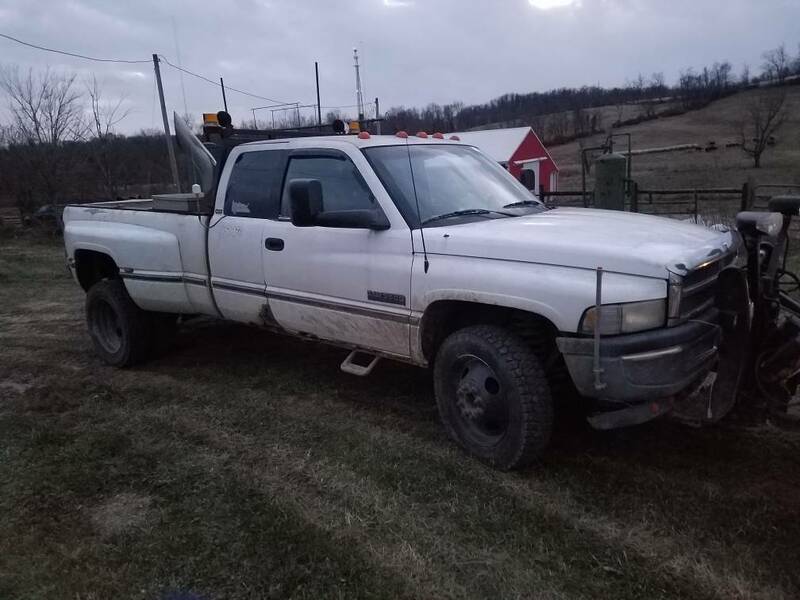 Neighbor was talking about selling his 97 3500eclb dually. Cab is rusty, bed is clean, interior is rough, auto has been built locally, but could probably use a service. Has 19.5" tires, 320k+ miles, he's currently driving it daily, but his wife said if he sold it for $5k she'd buy him a new one. Plow included also. Mild engine, tweaked pump, think it marine injectors, 62mm turbo, new head gasket with studs few yrs ago as well. im strongly considering this dime but the smoking vp as me a bit stand off ish. surely someone has that special heap parked by the barn. also a carton of square's is getting pretty pricy anymore. maybe a 3 pack of swisher sweets ( grape flavor ) to sweeten the deal. This is what im hoping to test. Fitment of these race truck whirly magigs. Must be hoping for that special giveaway truck. Don't you know everyone thinks their clapped out rusty POS is worth 5k plus? hell...... I will weld the rusted frame back together on the perfect test truck just to get a bargain. Man, it's not that bad, stacks are actually not crooked at all, just bullhauler style. And nothing is "see through" on the cab. And for this area, when he asked me about pricing it, I said I wouldn't be surprised to see it sell as high as $7500! Honestly don't think you're going to find what's in your mind. Drove a 4x4 home 6 months ago for $2200. They are out there. Have no need for anything nice.